Wine tour near Bratislava that takes you for wine tasting at local producer in Little Carpathian wine region is combined with a walk into the vineyards above the town of Svätý Jur. 3-hour or 4-hour tour by train from Bratislava into the real countryside. Svätý Jur is a picturesque small town settled above the vineyards of Little Carpathian mountains, located only 15 kilometers north from Bratislava city centre. Cozy atmosphere and history of this place make it a perfect destination for a short trip from Bratislava. You can choose from two versions of this experience. 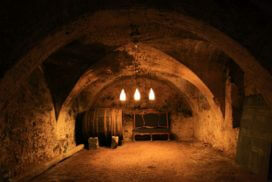 Carpathian Wine and Walk Tour (3 hours) is a private wine tasting at local wine cellar with a walk into the vineyards. 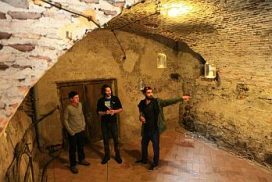 Carpathian Wine and Bike Tour (4 hours) is an adventurous journey into the vineyards on e-bicycles with wine tasting in the same renaissance house. Easily the most unique tour I have been on ever. You can only see so many churches, castles and palaces. Seeing the recent socialism past was a very different and eye-opening trip through Bratislava. This is what Bratislava is all about. Truly enjoyable and overwhelming. This was without doubt the best guided experience I have had to date. Juro did an fantastic job – both knowledgeable, enthusiastic and able tailor the experience to us. I give my highest recommendations to Authentic Slovakia. It was a fascinating trip through this dystopian architects’ playground, and a really interesting look at how a small city like Bratislava has coped with the onslaught of communism and the effects of sudden urbanisation and centralized planning. Transport by train is included. Please note: standard version of this tour is based on your train journey (train tickets are provided and included in the price) from Bratislava to Svätý Jur and back. 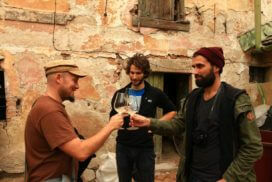 Our local partner, wine producer Michal Bažalík will take a good care of you in the location. If you prefer transport and pick-up from your accommodation or from the city centre with a private vehicle and our English-speaking guide, we are happy to do this for additional 50€ (passenger car up to 3-4 people) or 80€ (minivan for 4-7 passengers). How do you prefer to travel from Bratislava to Svätý Jur? In case of a car transport, where do you wish to be picked up?